Stacked rings are fun and creative. Layering jewelry, in general, is how we get to express our creativity and this is perhaps why this trend is so big at the moment. Are you looking for inspiration for your stackable rings look? Then you have reached the right place. In this article, you will not only learn how to wear rings. You will also discover six unique ideas on how to wear stacked rings. Read further to find out which idea is the best for you. Who doesn’t love gold? If you are like us, then you have gold jewelry in every color there is. And this is great news, by the way. Because now you can take your white gold, rose gold and yellow gold rings and wear all of them at the same time. The trick with this look is that you need to choose simple bands. Of course, the band design doesn’t have to be the same. You can try the stacked ring look by choosing a woven gold ring, a thin rose gold ring and a chunky white gold ring. It’s even more stylish this way, but make sure to avoid gemstones with this look. 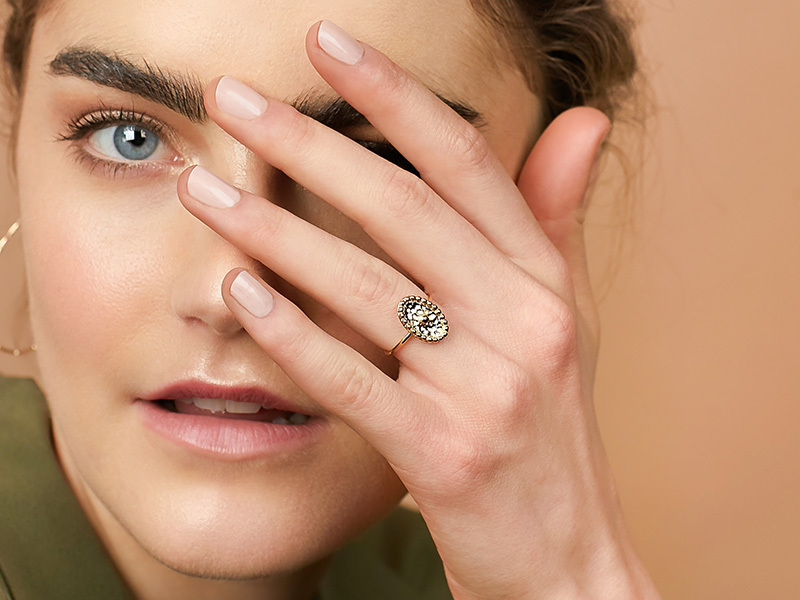 After all, you want your stacked rings look to be all about gold, don’t you? Wear a French manicure and a couple of thin gold bangles to continue the look. Avoid cuff and other chunky jewelry because you want your rings to be the focal point, not clash with your other jewelry. Black & white will never grow old and it’s great that now we can translate our favorite mix into jewelry as well. However, the same rule still applies. No gemstones, please, because this look is about the band. If you want a classy black & white stacked rings look, check our Ana Luisa’s lacquer rings. 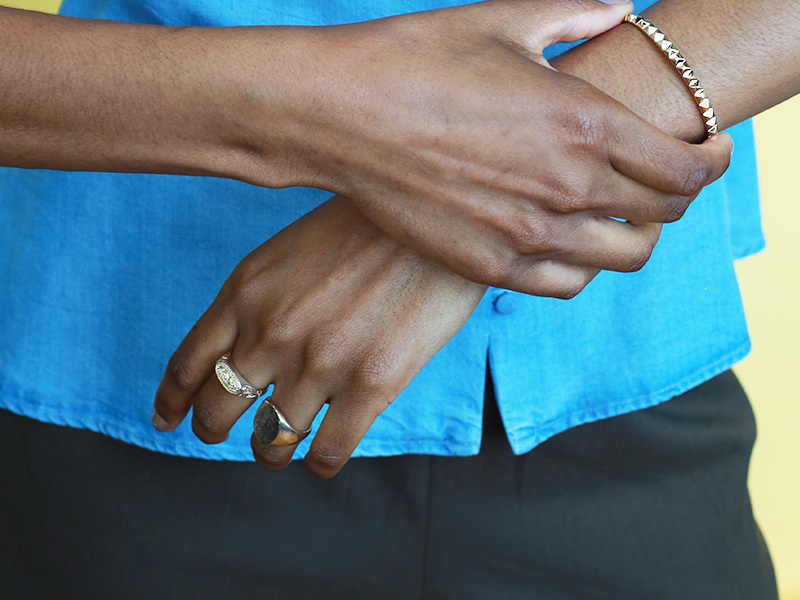 Elegant, beautiful and attention-grabbing, these rings are perfect for stacking. You can get the set or you can get them separately. We recommend the set, though, as it will allow you to try this creative look. You can also wear a chunky black cuff that will draw attention to your ring. Keep your necklace and earrings minimal and you have the recipe for a perfect look. You may not have been geometry’s biggest fan in high school, but when it comes to jewelry, that’s a whole different story. To get an edgy and creative look, you can wear geometric stacked rings. Choose different shapes like triangles, squares, and circles to pull off this look. If you want to take it one step further, wear a pair of geometric mismatched studs. To complete the look, choose a pair of tailored trousers and a crop blazer. Do we have to tell you to pull your hair back in a sleek ponytail? We guess not because you already have a great fashion sense. If you were wondering when we were going to reach the gemstones part with the stacked rings inspiration, here it is. Most gemstones don’t play well with each other as they fight for the attention. However, pearls are an exception to the rule. Choose two or three pearl rings and wear them on the same finger. Make sure you choose rings with different settings and designs, though. For example, a pearl solitaire ring will look fabulous when paired with a pearl eternity ring. Don’t be afraid to be bold and choose intricate designs. Pearls are how you throw a finger party, ladies. As a smart lady once said, a woman needs lots and lots of pearls. Why not wear them at once? 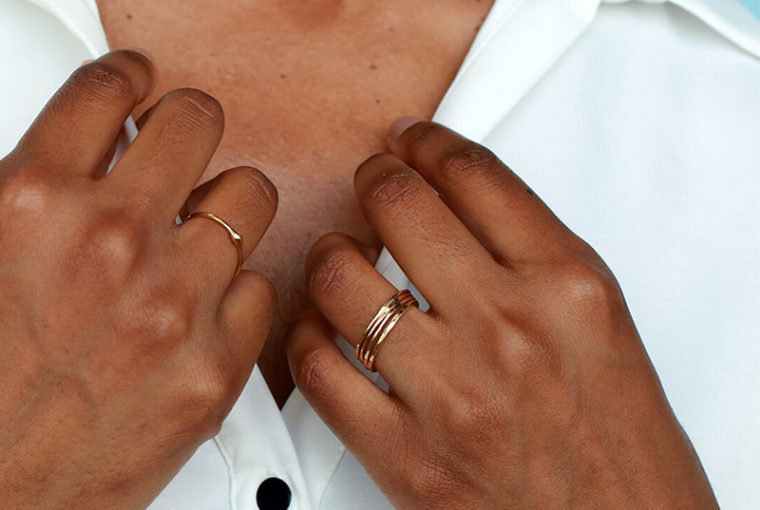 Sometimes less is more and, in this case, less means simply buying a stackable ring set. This is a more subtle look and it works great for business meetings, for example. 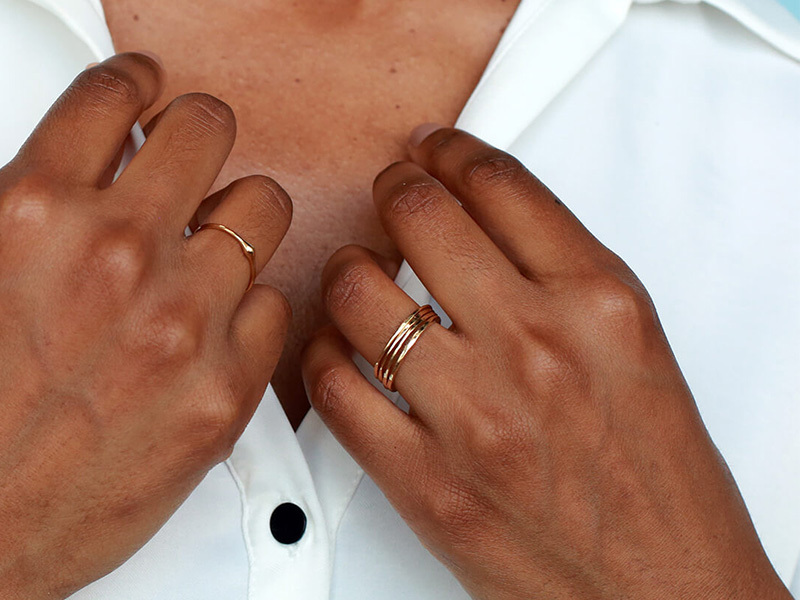 Ana Luisa’s Zoe stacking ring set features three feminine and subtle simple bands that look gorgeous together. To draw attention to your rings, simply try a deep red manicure. Keep it in the same style area and wear a dainty necklace and a pair of elegant studs to complete your look. If you want to add an edgy vibe to your stacked rings, simply wear a signet ring on your little finger. You can choose an all-metal design or a beautiful signet ring with an onyx gemstone for a power outfit. Why not combine an antique-looking ring with a contemporary one? This beautiful mix is not only creative, but also versatile and elegant. 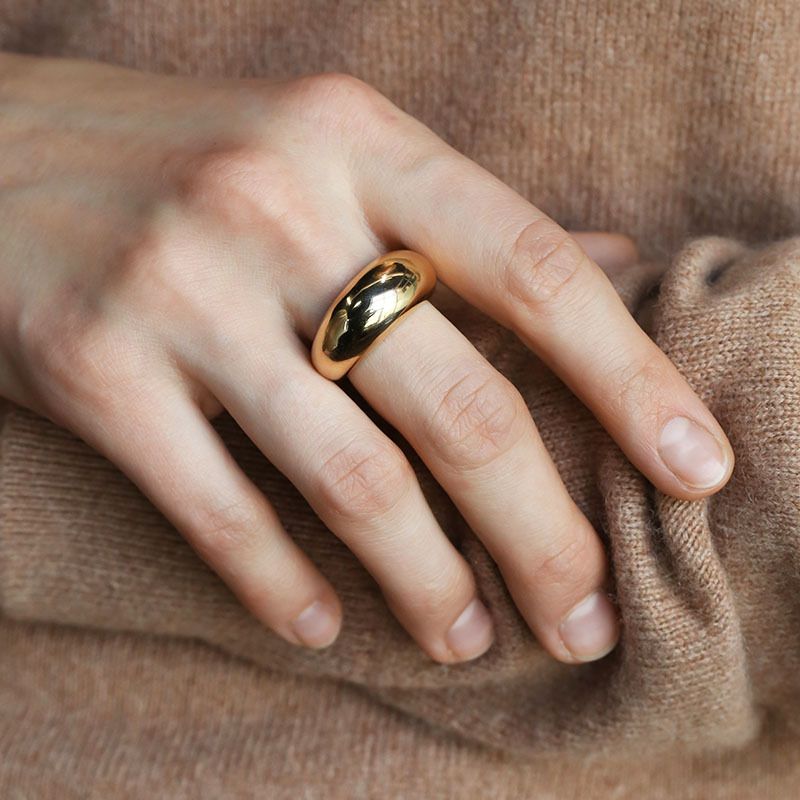 For example, you can choose Ana Luisa’s antique signet ring and wear it together with Ana Luisa’s Adina stacking ring. The first piece has a romantic antique vibe while the second one, with its futuristic look, speaks about modernity. Other suggestions would be a pearl ring with a geometric one or a coin ring with a woven band. If you enjoyed reading about stacked rings and discovering new ideas, check out our other articles as well. You will find a lot of interesting content on this blog and, by the time you finish reading it, you will know everything about jewelry trends, styles and more. To view any of the creations featured in this article, visit Ana Luisa online jewelry shop and check out our stackable rings collection.